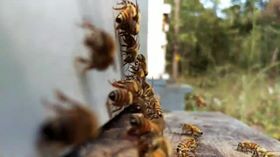 Worldwide there’s concern that the survival of many bee populations — in particular honeybees (Apis mellifera) — is threatened by several complex factors that will require a multi-pronged approach to resolve. The loss of natural habitat, stress, the lack of nutrition, the use of neonicotinoid insecticides, a parasitic mite (Varroa destructor), and many bacterial and viral diseases seem to be the prime causes of decline in all bee species. White clover (botanical name Trifolium repens) is a clover species that is indigenous to Europe, West Asia and Northern regions of Africa. Extensively introduced across the globe, this species is cultivated in the form of a pasture crop and is currently even common in the grassland regions of North America as well as New Zealand. White clover is also known as Dutch clover, as this species was cultivated in Holland for the first time. White clover is a herbaceous (herb-like) perennially growing small plant. It grows close to the ground and produces small whitish flower heads, which usually have a pink or creamy tinge, which may occur as the plant matures. Usually, the flower heads measure anything between 1.5 cm and 2.0 cm (0.6 inches and 0.8 inches) wide and appear at the end of the flower stalks or peduncles measuring about 7 cm or 2.8 inches.